Timely, actionable insights can ensure project success in a business environment that is volatile, uncertain, complex and ambiguous (VUCA). For meaningful insights, analysis of large amount of data (past, present and near real-time) is necessary; this obviously is humanly not possible. But now, for the first time, grappling with myriad business complexities in real-time is possible with RISHI-XAI! 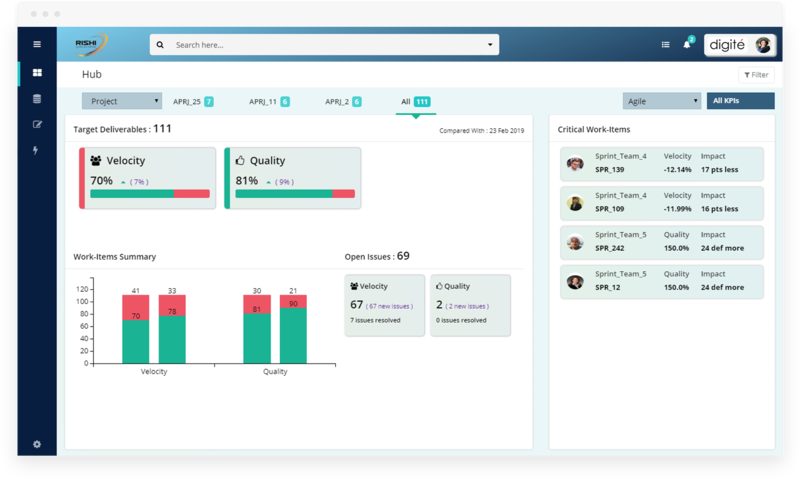 RISHI-XAI our new XAI based enterprise project intelligence product is integrated with factory models of multiple project types, like Agile, Maintenance, Testing, DevOps, etc. So this gives RISHI-XAI the ability to continuously learn and adapt to more business-critical situations. Our AI models are built on large volumes of project execution data which makes it more robust. RISHI-XAI’s design has an innovative automated pipeline that provides users “data provenance” (data traceability) and visibility into “feature engineering” enabling “Root Cause Analysis (RCA)” into the factors affecting project performance. These help in understanding the deviations in key indicators that drive enterprise success. Decision makers can set macro to micro level goals across projects by using RISHI-XAI’s powerful ‘What-If Scenario Analysis’ feature. This would help the users with different roles to track project goal deviations, on a near real-time basis. RISHI-XAI suggests actions that users could implement to reach the ‘set goals’. Further, they can visualize the impact of these actions before actually implementing them. We all understand the impact of a happy self-organizing team delivering value with high quality. The opposite is also true. Unhappy teams deliver bad quality in unacceptable timelines. Our products now come with the power of Team Dynamics. Using Artificial Intelligence and advanced NLP techniques including Sentiment Analysis, we can help you understand how your teams perform and react across projects, in real-time. Analyze work-item level emotions and automatically assign a score which is aggregated at the board/ project level. Track how happy or negative your team might be as a project progresses, issues arise and are addressed. 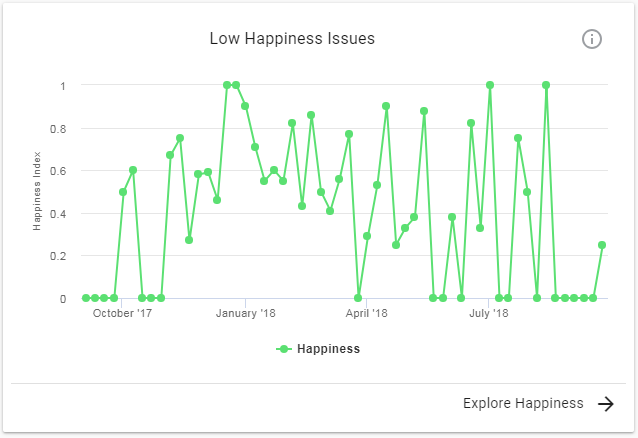 Step in when a team’s happiness index is lower than usual and ensure hidden issues are drawn out and resolved. Understand who influences your team and see how information flows among stakeholders using the Trust Network. 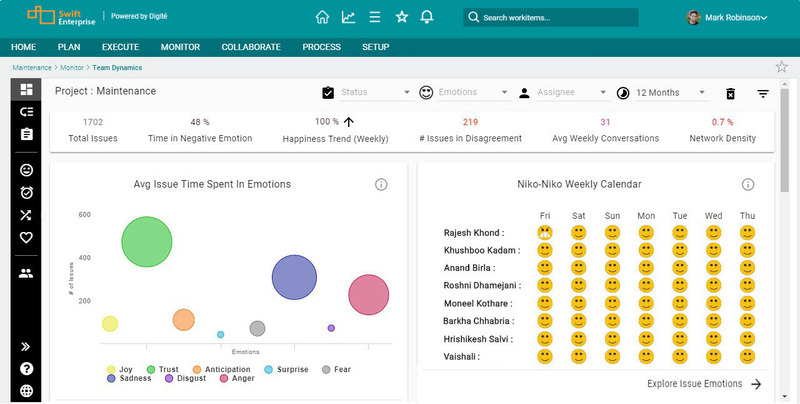 Multidimensional Team Dynamics Metrics (TDM) are generated by analyzing the sentiments, tones, disagreements, trust, and conflicts in team conversations within the project, using Advanced AI/ML to give you insight on how happy or unhappy the team is feeling. By connecting with DeepAffects, TDM provides insights into the team’s dynamic state (Performing, Storming, Outperforming, etc. ), trust network, conflicts & more. This module is available on our SaaS instances, as an add-on to any of our products. Leveraging the power of conversational AI, the SwiftEnterprise Chatbot on Slack lets you know what’s in your inbox and enables you to perform routine actions on them like route, reject and log time, right from your Slack channel. The AI assistant works based on context and intelligent dialogue management to ensure that you have smarter dialogue every time you interact with it, while the BOT continues to learn & improve through real conversations. This module is available as an add-on and is currently in BETA stage.